I’ve really been on a roll with the booze-flavored cupcakes, huh? Guinness & Bailey’s cupcakes, chocolate whiskey cupcakes, margarita cupcakes – what can I say, they are everyone’s favorites! My list of cupcake flavors to try had gotten a bit out of control, with recipes in cookbooks, magazines, on tons of food blogs, and in my own imagination. I finally took the time to consolidate them all and come up with a cupcake menu for the coworkers to use when making their birthday selections. These chocolate Kahlua cupcakes were the first flavor chosen from the list. I opted to use a one-bowl chocolate cupcake recipe for the cupcake base with some espresso powder mixed in to punch up the coffee flavor. 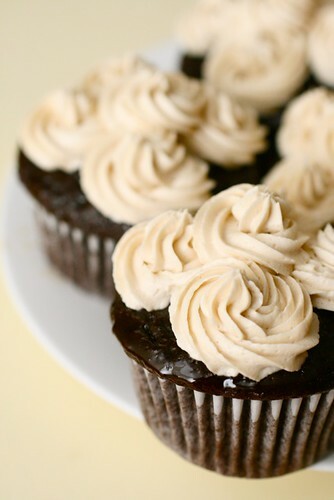 Brushing the cupcakes with Kahlua after baking helps keep them moist and infuses the flavor of the liqueur. For the frosting I whipped up this Kahlua buttercream, basically a classic boozey buttercream with a bit of whipping cream mixed in to help lighten the texture. I loved these, as did the coworkers because really, you just can’t go wrong with the combo of coffee, chocolate and alcohol. Any coffee-flavored liqueur can be substituted for the Kahlua, but that just happens to be what we have on hand. And because I know someone will ask, the tip I used to frost the cupcakes is a small (unlabeled) star tip. To make the cupcakes, preheat the oven to 350˚ F. Line standard cupcake pans with paper liners. In a large mixing bowl combine the cocoa powder, espresso powder, flour, sugar, baking soda, baking powder and salt; whisk well to blend. Add the eggs, warm water, buttermilk, vegetable oil and vanilla extract to the bowl with the dry ingredients and mix on medium-high speed until smooth, 2-3 minutes, scraping down the sides of the bowl as needed. Divide the batter evenly between the prepared cupcake liners, filling about 2/3 full. Bake until the tops spring back when pressed lightly, about 18-20 minutes, rotating the pans halfway through baking. Let cool in the pan 5-10 minutes, then transfer to a wire rack. Poke a few holes in the top of each cupcake with the tines of a fork and brush with Kahlua while still warm. Allow to cool completely. To make the frosting, beat the butter in the bowl of an electric mixer until smooth and fluffy, about 2 minutes. Mix in the confectioners’ sugar until incorporated. Add in the Kahlua and beat on medium speed until well blended. Add in the heavy cream and beat on medium-high speed for about 4 minutes, until light and fluffy. Frost cooled cupcakes as desired.